Dr. Lokesh is highly professional he understands your problem and explains the root causes & treatment in detail before starting the treatment. My experience of RCT and crowns was great.I would highly recommend to visit Dr Lokesh for any dental issue. Good person to get the treatment for all dental problems. The root canal and tooth extraction went smooth and both were performed without pain. Highly recommended. I am satisfied with my treatment,doctor friendliness , ,explanation of problems and the time he invest in a patient to hear their problems. I am thankful to the doctor for this painless treatment! He took time to explain the procedure. Very patient! I highly recommend this doc! Dr Lokesh is not only one of the finest dentist but a promising human being as well. I consulted him for my Father's multiple dental issues which he was suffering for a long time. His ********* **d ability to explain the details of treatment in simplest way is extraordinary, and it's not an exaggeration which you would concur once you meet him.The treatment covered multiple RCT, tooth extractions, crown and bridge fixing and span across 6 weeks. My father who otherwise is very fussy when it comes to any treatment showed highest level of satisfaction with no complaints of pain or discomfort. Seldom I see Dentists with such a high level of precision when it comes to tooth extraction and empathy towards patient. I strongly recommend him for any dental treatment.PS: My friend's son is getting braces treatment done at his clinic and it is looking promising so far. Highly recommendable, the doctor is polite and understands the problem well, treatment isn’t too stretching also. 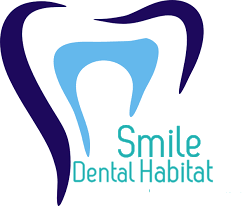 i would recommend Smile Dental Habitat for "PAINLESS" treatment. My friend gave me the reference for this clinic. he is very polite and treated very calmly.